Theodore R. Davis's illustration of President Johnson's impeachment trial in the Senate, published in Harper's Weekly. The House approved the articles of impeachment on March 2–3, 1868, and forwarded them to the Senate. The trial in the Senate began three days later, with Chief Justice Salmon P. Chase presiding. On May 16, the Senate failed to convict Johnson on one of the articles, with the 35–19 vote in favor of conviction falling short of the necessary two-thirds majority by a single vote. A ten-day recess was called before attempting to convict him on additional articles. The delay did not change the outcome, however, as on May 26, it failed to convict the President on two articles, both by the same margin; after which the trial was adjourned. This was the first impeachment of a President since creation of the office in 1789. The culmination of a lengthy political battle between Johnson, a lifelong Democrat and the Republican majority in Congress over how best to deal with the defeated Southern states following the conclusion of the American Civil War, the impeachment, and the subsequent trial (and acquittal) of Johnson were among the most dramatic events in the political life of the nation during the Reconstruction Era. Together, they have gained a historical reputation as an act of political expedience, rather than necessity, which was based on Johnson's defiance of an unconstitutional piece of legislation, and which was conducted with little regard for the will of a general public which, despite the unpopularity of Johnson, opposed the impeachment. Johnson is one of only three presidents against whom articles of impeachment have been reported to the full House for consideration. In 1974, during the Watergate scandal, the House Judiciary Committee approved articles of impeachment against Richard Nixon, who resigned from office, rather than face certain impeachment and the prospect of being convicted at trial and removed from office. In 1998, Bill Clinton was impeached; he, like Johnson, was acquitted of all charges following a Senate trial. Tension between the executive and legislative branches had been high prior to Johnson's ascension to the presidency. Following Union Army victories at Gettysburg and Vicksburg in July 1863, President Lincoln began contemplating the issue of how to bring the South back into the Union. He wished to offer an olive branch to the rebel states by pursuing a lenient plan for their reintegration. The forgiving tone of the president's plan, plus the fact that he implemented it by presidential directive without consulting Congress, incensed Radical Republicans, who countered with a more stringent plan. Their proposal for Southern reconstruction, the Wade–Davis Bill, passed both houses of Congress in July 1864, but was pocket vetoed by the president and never took effect. The assassination of Abraham Lincoln on April 14, 1865, just days after the Army of Northern Virginia's surrender at Appomattox briefly lessened the tension over who would set the terms of peace. The radicals, while suspicious of the new president and his policies, believed, based upon his record, that Andrew Johnson would defer, or at least acquiesce to their hardline proposals. Though a Democrat from Tennessee, Johnson had been a fierce critic of the Southern secession. Then after several states left the Union, including his own, he chose to stay in Washington (rather than resign his U.S. Senate seat), and later, when Union troops occupied Tennessee, Johnson was appointed military governor. While in that position he had exercised his powers with vigor, frequently stating that "treason must be made odious and traitors punished". Johnson, however, embraced Lincoln's more lenient policies, thus rejecting the Radicals, and setting the stage for a showdown between the president and Congress. During the first months of his presidency, Johnson issued proclamations of general amnesty for most former Confederates, both government and military officers, and oversaw creation of new governments in the hitherto rebellious states – governments dominated by ex-Confederate officials. In February 1866, Johnson vetoed legislation extending the Freedmen's Bureau and expanding its powers; Congress was unable to override the veto. Afterward, Johnson denounced Radical Republicans Representative Thaddeus Stevens and Senator Charles Sumner, along with abolitionist Wendell Phillips, as traitors. Later, Johnson vetoed a Civil Rights Act and a second Freedmen's Bureau bill; the Senate and the House each mustered the two-thirds majorities necessary to override both vetoes, setting the stage for a showdown between Congress and the president. At an impasse with Congress, Johnson offered himself directly to the American public as a "tribune of the people". In the late-summer of 1866, the president embarked on a national "Swing Around the Circle" speaking tour, where he asked his audiences for their support in his battle against the Congress and urged voters to elect representatives to Congress in the upcoming midterm election who supported his policies. The tour backfired on Johnson, however, when reports of his undisciplined, vitriolic speeches and ill-advised confrontations with hecklers swept the nation. Contrary to his hopes, the 1866 elections led to veto-proof Republican majorities in both houses of Congress. As a result, Radicals were able to take control of Reconstruction, passing a series of Reconstruction Acts—each one over the President's veto—addressing requirements for Southern states to be fully restored to the Union. The first of these acts divided those states, excluding Johnson's home state of Tennessee, into five military districts, and each state's government was put under the control of the U.S. military. Additionally, these states were required to enact new constitutions, ratify the Fourteenth Amendment, and guarantee voting rights for black males. Congress's control of the military Reconstruction policy was mitigated by Johnson's command of the military as president; however, Johnson had inherited, as Secretary of War, Lincoln's appointee Edwin M. Stanton, a staunch Radical Republican, who as long as he remained in office would comply with Congressional Reconstruction policies. To ensure that Stanton would not be replaced, Congress passed the Tenure of Office Act in 1867 over Johnson's veto. The act required the President to seek the Senate's advice and consent before relieving or dismissing any member of his Cabinet (an indirect reference to Stanton) or, indeed, any federal official whose initial appointment had previously required its advice and consent. "The Situation", a Harper's Weekly editorial cartoon shows Secretary of War Stanton aiming a cannon labeled "Congress" to defeat Johnson. The rammer is "Tenure of Office Bill" and cannonballs on the floor are "Justice". Because the Tenure of Office Act did permit the President to suspend such officials when Congress was out of session, when Johnson failed to obtain Stanton's resignation, he instead suspended Stanton on August 5, 1867, which gave him the opportunity to appoint General Ulysses S. Grant, then serving as Commanding General of the Army, interim Secretary of War. When the Senate adopted a resolution of non-concurrence with Stanton's dismissal in December 1867, Grant told Johnson he was going to resign, fearing punitive legal action. Johnson assured Grant that he would assume all responsibility in the matter, and asked him to delay his resignation until a suitable replacement could be found. Contrary to Johnson's belief that Grant had agreed to remain in office, when the Senate voted and reinstated Stanton in January 1868, Grant immediately resigned, before the president had an opportunity to appoint a replacement. Johnson was furious at Grant, accusing him of lying during a stormy cabinet meeting. The March 1868 publication of several angry messages between Johnson and Grant led to a complete break between the two. As a result of these letters, Grant solidified his standing as the frontrunner for the 1868 Republican presidential nomination. Johnson agonized about Stanton's restoration to office, and undertook a desperate search for someone to replace Stanton whom the Senate might find acceptable. He turned first to General William Tecumseh Sherman, who was an enemy of Stanton's, but Sherman turned the president down. Sherman subsequently suggested to Johnson that Republican radicals and moderates would be amenable to replacing Stanton with Jacob Cox, but he found the president to be no longer interested in appeasement. On February 21, 1868, the president appointed Lorenzo Thomas, a brevet major general in the Army, as interim Secretary of War, ordered the removal of Stanton from office, and informed the Senate of his actions. Thomas personally delivered the president's dismissal notice to Stanton, who refused either to accept its legitimacy or to vacate the premises. Instead, Stanton informed Speaker of the House Schuyler Colfax and President pro tempore of the Senate Benjamin Wade of his plight, then barricaded himself in his office and ordered Thomas arrested for violating the Tenure of Office Act. Thomas remained under arrest for several days, until Stanton, realizing that the case against Thomas would provide the courts with an opportunity to review the constitutionality of the Tenure of Office Act, had the charges dropped. Sir, the bloody and untilled fields of the ten unreconstructed states, the unsheeted ghosts of the two thousand murdered negroes in Texas, cry, if the dead ever evoke vengeance, for the punishment of Andrew Johnson. The impeachment resolution against Andrew Johnson, approved by the House of Representatives on February 24, 1868. On February 24, 1868 three days after Johnson's dismissal of Stanton, the House of Representatives voted 126 to 47 (with 17 members not voting) in favor of a resolution to impeach the President for high crimes and misdemeanors. Thaddeus Stevens addressed the House prior to the vote. "This is not to be the temporary triumph of a political party," he said, "but is to endure in its consequence until this whole continent shall be filled with a free and untrammeled people or shall be a nest of shrinking, cowardly slaves." Dismissing Edwin Stanton from office after the Senate had voted not to concur with his dismissal and had ordered him reinstated. Appointing Thomas Secretary of War ad interim despite the lack of vacancy in the office, since the dismissal of Stanton had been invalid. Appointing Thomas without the required advice and consent of the Senate. Conspiring, with Thomas and "other persons to the House of Representatives unknown", to unlawfully prevent Stanton from continuing in office. Conspiring to unlawfully curtail faithful execution of the Tenure of Office Act. Conspiring to "seize, take, and possess the property of the United States in the Department of War". Conspiring to "seize, take, and possess the property of the United States in the Department of War" with specific intent to violate the Tenure of Office Act. Issuing to Thomas the authority of the office of Secretary of War with unlawful intent to "control the disbursements of the moneys appropriated for the military service and for the Department of War". Issuing to Major General William H. Emory orders with unlawful intent to violate federal law requiring all military orders to be issued through the General of the Army. Making three speeches with intent to "attempt to bring into disgrace, ridicule, hatred, contempt and reproach, the Congress of the United States". Bringing disgrace and ridicule to the presidency by his aforementioned words and actions. On March 4, 1868, amid tremendous public attention and press coverage, the 11 Articles of Impeachment were presented to the Senate, which reconvened the following day as a court of impeachment, with Chief Justice Salmon Chase presiding, and proceeded to develop a set of rules for the trial and its officers. The extent of Chase's authority as presiding officer to render unilateral rulings was a frequent point of contention during the rules debate and trial. He initially maintained that deciding certain procedural questions on his own was his prerogative; but after the Senate challenged several of his rulings, he gave up making rulings. On one occasion, when he ruled that Johnson should be permitted to present evidence that Thomas's appointment to replace Stanton was intended to provide a test case to challenge the constitutionality of the Tenure of Office Act, the Senate reversed the ruling. When it came time for senators to take the juror's oath, Thomas Hendricks questioned Benjamin Wade's impartiality and suggested that Wade abstain from voting due to a conflict of interest. As there was no constitutional provision at the time for filling an intra-term vacancy in the vice presidency (accomplished a century later by the Twenty-fifth Amendment), the office had been vacant since Johnson succeeded to the presidency. Therefore, Wade, as President pro tempore of the Senate, would, under the Presidential Succession Act then in force and effect, become president if Johnson were removed from office. Reviled by the radical majority, Hendricks withdrew his objection a day later and left the matter to Wade's own conscience; he subsequently voted for conviction. The House impeachment committee was made up of: John Bingham, George S. Boutwell, Benjamin Butler, John A. Logan, Thaddeus Stevens, James F. Wilson, and Thomas Williams. The president's defense team was made up of Henry Stanbery, William M. Evarts, Benjamin R. Curtis, Thomas A. R. Nelson and William S. Groesbeck. On the advice of counsel, the president did not appear at the trial. The trial was conducted mostly in open session, and the Senate chamber galleries were filled to capacity throughout. Public interest was so great that the Senate issued admission passes for the first time in its history. For each day of the trial, 1,000 color coded tickets were printed, granting admittance for a single day. On the first day, Johnson's defense committee asked for 40 days to collect evidence and witnesses since the prosecution had had a longer amount of time to do so, but only 10 days were granted. The proceedings began on March 23. Senator Garrett Davis argued that because not all states were represented in the Senate the trial could not be held and that it should therefore be adjourned. The motion was voted down. After the charges against the president were made, Henry Stanbery asked for another 30 days to assemble evidence and summon witnesses, saying that in the 10 days previously granted there had only been enough time to prepare the president's reply. John A. Logan argued that the trial should begin immediately and that Stanberry was only trying to stall for time. The request was turned down in a vote 41 to 12. However, the Senate voted the next day to give the defense six more days to prepare evidence, which was accepted. The trial commenced again on March 30. Benjamin F. Butler opened for the prosecution with a three-hour speech reviewing historical impeachment trials, dating from King John of England. For days Butler spoke out against Johnson's violations of the Tenure of Office Act and further charged that the president had issued orders directly to Army officers without sending them through General Grant. The defense argued that Johnson had not violated the Tenure of Office Act because President Lincoln did not reappoint Stanton as Secretary of War at the beginning of his second term in 1865 and that he was therefore a leftover appointment from the 1860 cabinet, which removed his protection by the Tenure of Office Act. The prosecution called several witnesses in the course of the proceedings until April 9, when they rested their case. Benjamin R. Curtis called attention to the fact that after the House passed the Tenure of Office Act, the Senate had amended it, meaning that it had to return it to a Senate–House conference committee to resolve the differences. He followed up by quoting the minutes of those meetings, which revealed that while the House members made no notes about the fact, their sole purpose was to keep Stanton in office, and the Senate had disagreed. The defense then called their first witness, Adjutant General Lorenzo Thomas. He did not provide adequate information in the defense's cause and Butler made attempts to use his information to the prosecution's advantage. The next witness was General William T. Sherman, who testified that President Johnson had offered to appoint Sherman to succeed Stanton as Secretary of War in order to ensure that the department was effectively administered. This testimony damaged the prosecution, which expected Sherman to testify that Johnson offered to appoint Sherman for the purpose of obstructing the operation, or overthrow, of the government. Sherman essentially affirmed that Johnson only wanted him to manage the department and not to execute directions to the military that would be contrary to the will of Congress. The Senate was composed of 54 members representing 27 states (10 former Confederate states had not yet been readmitted to representation in the Senate) at the time of the trial. At its conclusion, senators voted on three of the articles of impeachment. On each occasion the vote was 35–19, with 35 senators voting guilty and 19 not guilty. As the constitutional threshold for a conviction in an impeachment trial is a two-thirds majority guilty vote—in this case 36 votes—Johnson was not removed from office. Seven Republican senators were concerned that the proceedings had been manipulated to give a one-sided presentation of the evidence. Senators William Pitt Fessenden (Maine), Joseph S. Fowler (Tennessee), James W. Grimes (Iowa), John B. Henderson (Missouri), Lyman Trumbull (Illinois), Peter G. Van Winkle (West Virginia), and Edmund G. Ross (Kansas), who provided the decisive vote, defied their party by voting against conviction. In addition to the aforementioned seven, three more Republicans James Dixon (Connecticut), James Doolittle (Wisconsin), Daniel Norton (Minnesota), and all nine Democratic Senators voted not guilty. The first vote was taken on May 16 for the eleventh article. Prior to the vote, Samuel Pomeroy, the senior senator from Kansas, told the junior Kansas Senator Ross that if Ross voted for acquittal that Ross would become the subject of an investigation for bribery. Afterward, in hopes of persuading at least one senator who voted not guilty to change his vote, the Senate adjourned for 10 days before continuing voting on the other articles. During the hiatus, under Butler's leadership, the House put through a resolution to investigate alleged "improper or corrupt means used to influence the determination of the Senate". Despite the Radical Republican leadership's heavy-handed efforts to change the outcome, when votes were cast on May 26 for the second and third articles, the results were the same as the first. After the trial, Butler conducted hearings on the widespread reports that Republican senators had been bribed to vote for Johnson's acquittal. In Butler's hearings, and in subsequent inquiries, there was increasing evidence that some acquittal votes were acquired by promises of patronage jobs and cash cards. Nonetheless, the investigations never resulted in charges, much less convictions, against anyone. Moreover, there is evidence that the prosecution attempted to bribe the senators voting for acquittal to switch their votes to conviction. Maine Senator Fessenden was offered the Ministership to Great Britain. Prosecutor Butler said, "Tell [Kansas Senator Ross] that if he wants money there is a bushel of it here to be had." Butler's investigation also boomeranged when it was discovered that Kansas Senator Pomeroy, who voted for conviction, had written a letter to Johnson's Postmaster General seeking a $40,000 bribe for Pomeroy's acquittal vote along with three or four others in his caucus. Benjamin Butler was himself told by Ben Wade that Wade would appoint Butler as Secretary of State when Wade assumed the Presidency after a Johnson conviction. An opinion that Senator Ross was mercilessly persecuted for his courageous vote to sustain the independence of the Presidency as a branch of the Federal Government is the subject of an entire chapter in President John F. Kennedy's book, Profiles in Courage. That opinion has been rejected by some scholars, such as Ralph Roske, and endorsed by others, such as Avery Craven. Not one of the Republican senators who voted for acquittal ever again served in an elective office. Although they were under intense pressure to change their votes to conviction during the trial, afterward public opinion rapidly shifted around to their viewpoint. Some senators who voted for conviction, such as John Sherman and even Charles Sumner, later changed their minds. In 1887, the Tenure of Office Act was repealed by Congress, and subsequent rulings by the United States Supreme Court seemed to support Johnson's position that he was entitled to fire Stanton without Congressional approval. The Supreme Court's ruling on a similar piece of later legislation in the 1926 Myers v. United States affirmed the ability of the president to remove a postmaster without Congressional approval, and stated in its majority opinion "that the Tenure of Office Act of 1867 ... was invalid". Once set the example of impeaching a President for what, when the excitement of the hour shall have subsided, will be regarded as insufficient causes, as several of those now alleged against the President were decided to be by the House of Representatives only a few months since, and no future President will be safe who happens to differ with a majority of the House and two thirds of the Senate on any measure deemed by them important, particularly if of a political character. Blinded by partisan zeal, with such an example before them, they will not scruple to remove out of the way any obstacle to the accomplishment of their purposes, and what then becomes of the checks and balances of the Constitution, so carefully devised and so vital to its perpetuity? They are all gone. ^ Burlingame, Michael. "Abraham Lincoln: Domestic Affairs". Charlottesville, Virginia: Miller Center of Public Affairs, University of Virginia. Retrieved April 14, 2018. ^ a b c d Whittington, Keith E. (March 2000). "Bill Clinton Was No Andrew Johnson: Comparing Two Impeachments" (PDF). Journal of Constitutional Law. Philadelphia, Pennsylvania: University of Pennsylvania. 2 (2): 422–465. Retrieved April 14, 2018. ^ Campbell, James M.; Fraser, Rebecca J., eds. (2008). Reconstruction: People and Perspectives. Santa Barbara, California: ABC-CLIO. p. xv. ISBN 978-1-59884-021-6. ^ Trefousse, Hans L. (1989). Andrew Johnson: A Biography. New York City: W. W. Norton & Company. pp. 193–213. ISBN 978-0-393-31742-8. ^ a b "Andrew Johnson – Key Events". Charlottesville, Virginia: Miller Center of Public Affairs, University of Virginia. Retrieved May 8, 2018. ^ Trefousse, Hans L. (1989). Andrew Johnson: A Biography. New York City: W. W. Norton & Company. pp. 234–254. ISBN 978-0-393-31742-8. ^ a b Varon, Elizabeth R. "Andrew Johnson: Domestic Affairs". Charlottesville, Virginia: Miller Center of Public Affairs, University of Virginia. Retrieved April 14, 2018. ^ Kennedy, David M.; Bailey, Thomas (2009). The American Spirit: U.S. History as Seen by Contemporaries, Volume II: Since 1865 (Twelfth ed.). Cengage Learning. pp. 17–19. ISBN 978-0-495-80002-6. ^ Hacker, Jeffrey H. (2014). Slavery, War, and a New Birth of Freedom: 1840s-1877 (revised ed.). Taylor & Francis. p. 144. ISBN 978-0-7656-8324-3. ^ Chernow, Ron (2017). Grant. New York: Penguin Press. p. 594. ISBN 978-1-5942-0487-6. ^ Trefousse, Hans L. (1989). Andrew Johnson: A Biography. New York City: W. W. Norton & Company. pp. 275–299. ISBN 978-0-393-31742-8. ^ a b c d e "The Impeachment of Andrew Johnson (1868) President of the United States". Washington, D.C.: Historical Office, United States Senate. Retrieved April 13, 2018. ^ a b Burg, Robert (2012). Manweller, Mathew (ed.). Chronology of the U.S. Presidency [4 volumes]. ABC-CLIO. p. 545. ISBN 978-1-59884-645-4. ^ White, Ronald C. (2016). American Ulysses: A Life of Ulysses S. Grant. Random House Publishing Group. p. 453. ISBN 978-1-5883-6992-5. ^ Chernow, Ron (2017). Grant. New York: Penguin Press. p. 603. ISBN 978-1-5942-0487-6. ^ White, Ronald C. (2016). American Ulysses: A Life of Ulysses S. Grant. Random House Publishing Group. pp. 454–455. ISBN 978-1-5883-6992-5. ^ Marvel, William (2015). Lincoln's Autocrat: The Life of Edwin Stanton. University of North Carolina Press. p. 437. ISBN 978-1-46962249-1. ^ Benedict, Michael Les (Fall 1998). "A New Look at the Impeachment of Andrew Johnson". Political Science Quarterly. Academy of Political Science. 113 (3). Retrieved April 27, 2018. ^ Trefousse, Hans L. (1989). Andrew Johnson: A Biography. New York City: W. W. Norton & Company. p. 306. ISBN 978-0-393-31742-8. ^ Marvel, William (2015). Lincoln's Autocrat: The Life of Edwin Stanton. University of North Carolina Press. p. 443. ISBN 978-1-46962249-1. ^ a b Glass, Andrew (February 24, 2015). "House votes to impeach Andrew Johnson, February 24, 1868". www.politico.com. Retrieved April 24, 2018. ^ Brockett, L. P. (1872). Men of our day; or, Biographical sketches of patriots, orators, statesmen, generals, reformers, financiers and merchants, now on the stage of action: including those who in military, political, business and social life, are the prominent leaders of the time in this country. Philadelphia, Pennsylvania: Zeigler, McCurdy. p. 502 – via Internet Archive, 2009. ^ Gerhardt, Michael J. "Trial of Impeachment". Heritage Guide to the Constitution. Heritage Foundation. Retrieved May 10, 2018. ^ Herrick, Neal Q. (2009). After Patrick Henry: A Second American Revolution. New York City: Black Rose Books. p. 207. ISBN 978-1-55164-320-5. ^ Hearn, Chester G. (2000). The Impeachment of Andrew Johnson. Jefferson, North Carolina: McFarland. ISBN 0-7864-0863-4. ^ Foner, Eric (1988). Reconstruction: America's Unfinished Revolution, 1863–1877. HarperCollins. p. 336. ISBN 9780062035868. ^ "List of Individuals Impeached by the House of Representatives". Washington, D.C.: Office of the Historian and the Clerk of the House's Office of Art and Archives. Retrieved May 10, 2018. ^ "President Andrew Johnson's impeachment trial, 1868". Washington, D.C.: Historical Office, United States Senate. Retrieved May 14, 2018. ^ Committee on the Judiciary; House of Representatives; Ninety-third Congress; Second Session (1974). Impeachment: Selected Materials on Procedure. U.S. Government Printing Office. pp. 104–5. ^ David O. Stewart (2009). Impeached: The Trial of President Andrew Johnson and the Fight for Lincoln's Legacy. Simon and Schuster. pp. 207–12. ^ Stewart. Impeached: The Trial of President Andrew Johnson and the Fight for Lincoln's Legacy. p. 231. 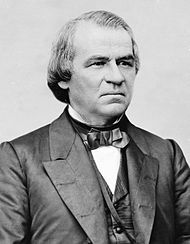 ^ "Andrew Johnson Trial: The Consciences of Seven Republicans Save Johnson." ^ "The Trial of Andrew Johnson, 1868." ^ Stewart, Impeached (2009), pp. 240–249, 284–299. ^ Ross, Edmund G. (1896). History of the Impeachment of Andrew Johnson, President of The United States By The House Of Representatives and His Trial by The Senate for High Crimes and Misdemeanors in Office 1868 (PDF). pp. 105–107. Retrieved April 26, 2018 – via Project Gutenberg, 2000. ^ White, Horace. The Life of Lyman Trumble. Boston and New York: Houghton Mifflin Co., 1913, p. 319. Sigelman, Lee, Christopher J. Deering, and Burdett A. Loomis. "Wading Knee Deep in Words, Words, Words": Senatorial Rhetoric in the Johnson and Clinton Impeachment Trials." Congress & the Presidency 28#2 (2001) pp 119–139.